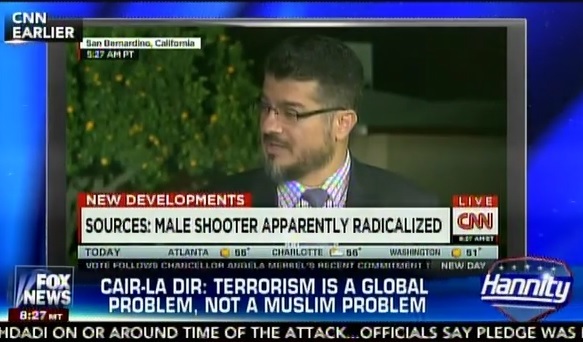 CAIR LA spokesman Hussam Ayloush blamed American foreign policy for Islamic terrorism today in a CNN interview. We complain that what are the Muslim people doing to root out terrorism and extremism. Let’s not forget that some of our own foreign policy as Americans as the West has fueled that extremism. When we support coup leaders in Egypt or some other place, when we support dictatorships, oppressive regimes around the world that push people over to the edge, then they become extremists, then they become terrorists, we are partly responsible. Look terrorism is a global problem not a Muslim problem. In other words, the Muslims are the real victims. In a Friday CNN interview, Hussam Ayloush, of the group’s Los Angeles chapter, said American foreign policy has helped fuel the rage that drives Muslim radicals to kill in the name of their faith. “Let’s not forget that some of our own foreign policy, as Americans, as the west, have fueled that extremism,” Ayloush told “New Day” host Chris Cuomo during a discussion about Wednesday’s terrorist attack in San Bernardino, Calif., where a Muslim married couple killed 14 and wounded 21 at a holiday party for the county health department that employed the husband, Syed Rizwan Farook.